John says that the LNW Royal Train delivered Edward and Alexandra to this large station in about 1906, but where is it? The only clue to this location is the distinctive Footbridge. So can I "open the bidding" with Manchester Exchange? The identity of this location showing the Royal Train could possibly be Carlisle Citadel Station as that magnificent train hall has an overbridge identical to this one within its cavernous space. The bracket in front of the footbridge is possibly be one of the many supports that supported the overall roof of this magnificent station which is very much in use today. Not Manchester Exchange I think - footbridge not in this position. How about Birmingham New Street? My immediate reaction on seeing the photograph (and before noticing Peter Scott's comment) was Manchester Exchange, though I have no idea of what the occasion was which took Edward VII there. Having done a Google I have found the following information: King Edward VII and Queen Alexandra visited Manchester on Thursday July 13th 1905 to open the then new number 9 dock at Manchester Docks. The Royal Train arrived at 12:30am at Manchester Victoria Station. The royal couple also visited Newcastle, York, Edinburgh and Aberdeen, India (twice) and Canada during 1905/06. They also made a visit to Knowsley Hall before returning to Manchester via rail in 1905, unfortunately the source does not say anything further. I didn't think this looked like an LNWR station - see the "Platform" sign on the right and the signal bracket(?) at the left, and then, oddly enough I saw the photo yesterday, in a newish photo-album whose title I have forgotten. The caption carefully explained which of these chaps King Edward VII was, and said the photo was taken in September 1906, at Newcastle-upon-Tyne. The photo-album I saw which identified this photo as Newcastle is Yesterday's Railways by Peter Herring (D&C, 2002 and later editions). I think the photograph of Edward VII and Alexander was taken on July 5th 1905 either at Victoria Station Manchester or Sheffield. I have been trying to find out about this visit to Knowsley Hall (Lord Derby's home) as it was this visit that sparked off the beginning of my family. If you look at this visit in a search engine or put in Edward VII visit to Knowlsey Hall July 1905 you will be taken to a site that tells of the actual train route via Sheffield which seems a long way round. I can confirn that the location is definitely Newcastle Central Station. The footbridge in the photo is of the same structure today with the outside brackets of the footbridge a telling indication. In addition to this I have found another version of the photograph which shows a larger area and a 'Welcome To Newcastle Upon Tyne' banner put up for the arrival of the King and Queen in July 1906 that is not shown on your photograph. A different version of the same photo can be found here. 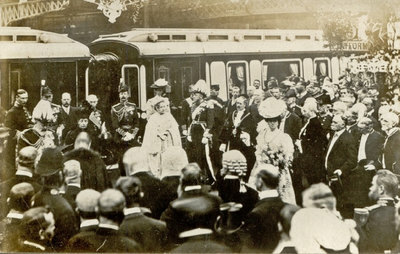 The King and Queen visited Newcastle and Gateshead in July 1906 to open the King Edward rail bridge over the Tyne at the south of Newcastle Central Station on July 10th 1906 and the next day they opened the Royal Victoria Hospital in Newcastle Upon Tyne.